Here are my samples for my card class at the end of the month. 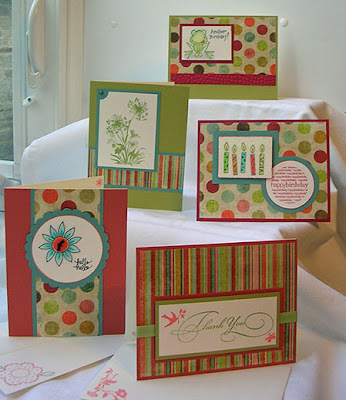 We are concentrating on stamping in color (although I just couldn't resist a little coloring in!) and on decorating the inside of the cards (and even the envelopes). I'm also including a few embellishments we have not used yet - microbeads on the birthday candles and a tied button on the hello card. 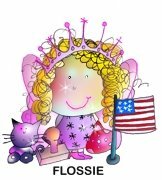 The class includes 2 Versamagic Dew Drop stamp pads and one Colorbox fluid chalk cats eye for each participant along with all the supplies needed to make the cards. 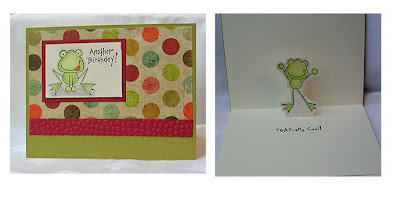 The froggy is a pop up card, something I have not done with this group before either. I'm fortunate in that this is a really great group that comes to the classes. We always have so much fun! I still have a few spots open, so if you live in the Philadelphia area - come join us! You can read about the classes on the Paper Garden Projects website. Love them all. Hmm, wonder how far of a drive it is to Philly.....LOL!! Oh, I love them all! I wish Philly were closer, I'd totally join in the fun! PS-thanks for figuring out that I botched my email address on my order! Wow, you did a lot. My fave is the frog. I love frog stamps!! I wish I could come! Great idea to feature interior designs on the cards and the envelopes.